T-Shirt designs for NAMI MI designed by Emily Vince. Proposed new logo and icon designs for MUFI by Sarah Allen, Dayna Berzack, and Elizabeth Suchocki. Proposed new logo seen on images for MUFI by Zak Plaxton, Blake Foster, and David Beasley. New logo design for The Art Experience by Melissa Flores, Kelsey Schrader and Taylor Reyes featured on their updated website (completed by a designer outside of the course). Pattern for The Michigan Humane Society by Lauren Hartley, Garrett Ebbling and Taylor Reyes. Webster Community Center logo designed by Piper Lehto, Zak Plaxton and Elizabeth Suchocki. Bilingual postcard design for Shakespeare in Detroit by Jeanette Handy and Ciara Rechtzigel. Want to be a non-profit for next semester? Propose a project here, or find out more here. Meeting with clients and working with within a “real-world” design concept really help me prepare for a career after graduation. Presentation Proposal Slide Example featuring billboard design for Organization for Bat Conservation's exhibit BATS: Superheroes of the Night! from student designers Jim Muehlheim, Lana Karim, and Kevin Mendez. 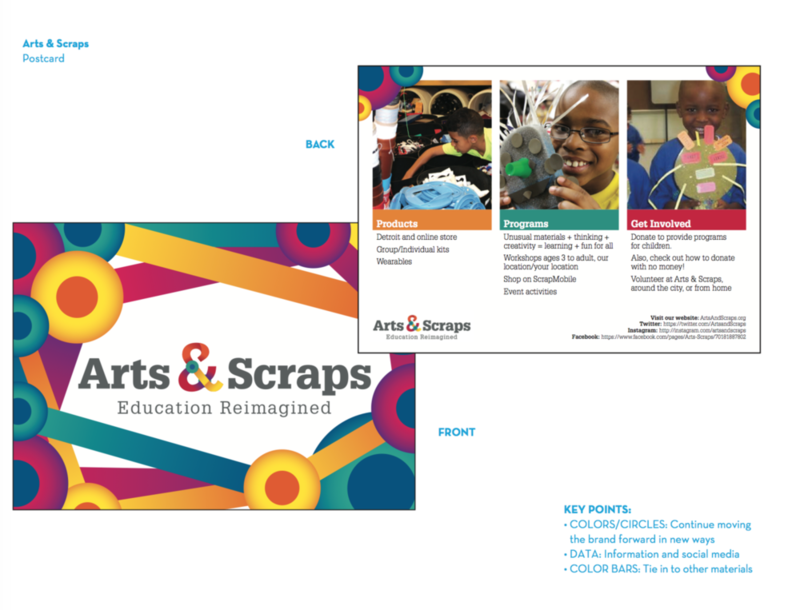 Presentation Proposal Slide Example featuring postcard design for Arts & Scraps from student designers Kathleen Peterson, Lindsay Quinn and Jim Muehlheim. Follow along with us on Instagram, @goodcommunitydesign.